MacKeeper is promoted as a Mac maintenance and optimization tool. Its developers claim that it's a number one selection of millions of Mac users due to powerful scan engine, 24/7 support service, and other advantages. However, when looking at its reviews online, users' opinions divide into two groups. A part of users claim it to be one of the best optimization tools used ever; the others consider it to be a virus due to MacKeeper popup ads. However, it's a fact that MacKeeper is NOT a virus, and it can't perform illegal activities on user's PC. Not dangerous. It's a legitimate Mac optimization tool that does not implement malicious activities on the system. Why is it called a virus? If you are not satisfied with this tool, you can eliminate it manually or with the help of Reimage. MacKeeper has been launched in 2010 by ZeoBIT, LLC. In 2013, the software was sold to Kromtech Alliance Corp. The previous company, ZeoBIT, used aggressive marketing strategies to promote the MacKeeper software, which consequently earned a bad reputation for the product. As a result, the company was sued for using deceptive tactics to convince users to purchase the full version of the software. According to AppleInsider, the company didn't admit its fault but agreed to settle the lawsuit for $2 million instead of going to trial. The indicated amount of money was put into a fund to cover expenses of attorney fees, refunds to users and administrative costs. Therefore, users who purchased the software prior to July 8, 2015, were eligible for a full refund. However, those willing to fill a claim had to do it before November 30, 2015. As we move forward in this next chapter, one of our main focuses is to change the way MacKeeper™ is advertised and marketed: we’ve improved our advertising to offer useful and helpful information; we’ve revised the language used during our software installation process to make it the best customer experience possible; and in the coming months we will be donating much of our extra advertising space to non-profit organizations and worthy causes. 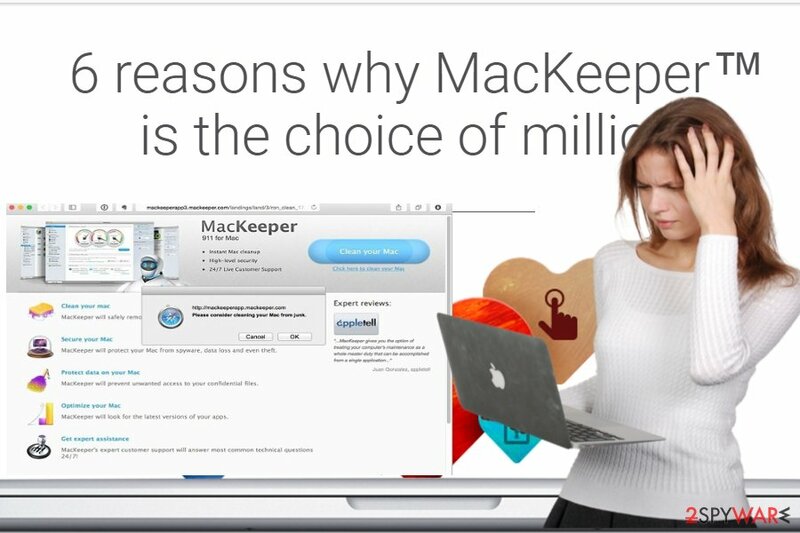 We want to earn the trust and customer loyalty that MacKeeper™ deserves. Such statements really do sound promising. Although it takes a lot of time to rebuild user trust, it seems that the company is taking small steps towards this goal. We can already see fewer complaints about MacKeeper ads in online forums. The latest version of the tool receives few negative reports, meaning that the company has already did much to get rid of erratic advertising campaigns and other traits disapproved by Mac users. However, some of the user reviews give an impression that there is a lot of space for improvement, especially when talking about earlier versions. A popular discussion on Reddit shows that users are still looking for an answer on how to get rid of mackeeper pop up. 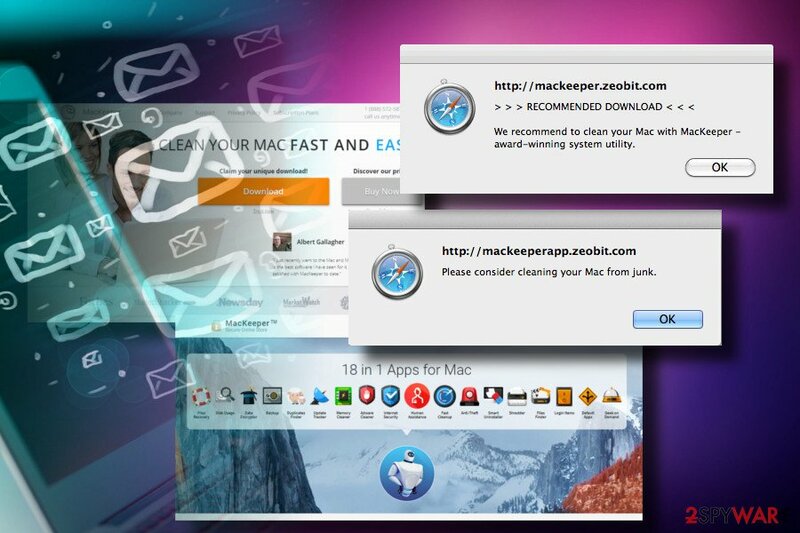 Consequently, the site suggests to “remove viruses now,” and clicking the button downloads MacKeeper to user's computer. However, we couldn't find any statements explaining how the web page detected “2 malware and 1 phishing/spyware” on our computer, which seemed suspicious and not really convincing to install the Mac maintenance product. 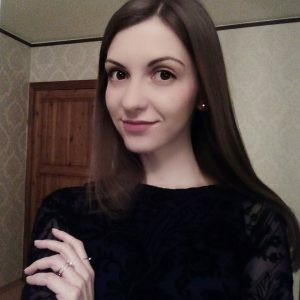 We hope that such advertising techniques will be replaced with different ones soon – in our opinion, it isn't the best way to advertise a software when trying to earn users' trust. While writing this article, we have downloaded the installer of the said program and uploaded it to VirusTotal file-scanning engine. The results showed that 8 out of 58 computer scanners identify this file differently – some of them recognize it as a potentially unwanted program, while others mark it as riskware. However, the rest of scanners identify it as clean file, and we believe that if the new owners of the software continue to update the product, the detection ratio will drop to zero. In case you no longer want to keep the described program, you can find easy MacKeeper removal guidelines below the article. Mac users who have been tricked into installing the older version of this program didn't seem to be too happy about it. Although the previous MacKeeper version was also presented as an optimization program which can improve computer's performance, many people reported it for not initiating significant changes that would boost Mac's performance. The most annoying thing, according to users, is that it displays ads and keeps opening Chrome automatically. 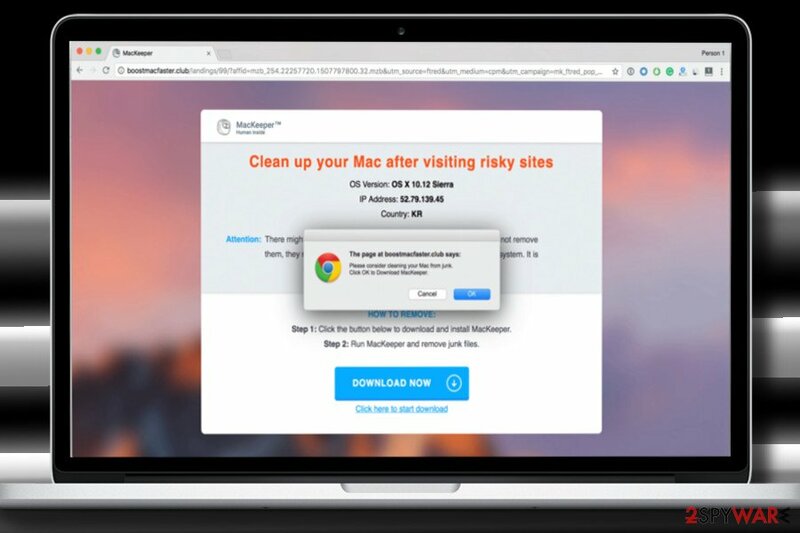 Despite the fact that some people may consider such activities malicious, MacKeeper advertising campaigns are more intrusive than destructive. In many cases, MacKeeper optimizer appears not to be guilty for the ads that people receive. The culprit may be related to the adware-type programs that people may install bundled with freeware, so checking the system for ad-supported applications is a must before judging a particular program that is advertised via the pop-ups. In a nutshell, MacKeeper is not a virus. The latest version of the software presented by Kromtech can turn out to be extremely useful for improving Mac's performance. The security experts used to rank the previous version as a potentially unwanted program (PUP) and recommended users to remove MacKeeper from their computers without a doubt. That cannot be said about the new version, however, if you feel that it does not meet your expectations, you can easily uninstall it the way regular computer programs are uninstalled (via Control Panel). MacKeeper is presented as a highly popular product. Nevertheless, we do not recommend using this questionable tool. The only place to download current and legitimate version of MacKeeper is its official website and verified distributors' webpages. You should never attempt to download it from suspicious file sharing sites or, even worse, attempt to obtain its full version illegally. We must remind you that attempts to install paid license versions for free using software cracks or keygens can not only result in accusations of copyright infringement but a serious malware infection as well. You must know that cracks are often filled with malicious software such as Trojans that can spy on your activity. If you are looking for Mac maintenance program, you might consider using MacKeeper. It may help you to improve your computer's performance, but make sure that you use the legitimate copy of it. In addition, we recommend following the tip provided by NoVirus.uk to keep your Mac spyware-free. Today, Mac OS can be affected by adware in the same way as Windows. It means that your Mac may get infected with an adware right after installing another freeware. Therefore, we highly recommend you to be careful when installing software from the Internet. Besides, you should start checking freeware before downloading them on your computer. In order to make sure if your selected program is filled with “optional downloads”, you should select “Advanced” or “Custom” installation option and carefully check every checkbox. The most important thing that you have to do is to find the list of 'optional downloads' and unmark all additional programs. In case annoying pop-ups started bothering you, you may need to check your system for adware programs. If you decided that MacKeeper does not meet your expectations and you would like to remove it, you can use simple guidelines prepared by our team. In fact, the same instructions can be used for removal of any other legitimate Mac app. Simply be careful when removing it, and it won't bother you again. Full MacKeeper removal guidelines can be found down below. To remove MacKeeper, go to Applications folder and drag the unwanted program to Trash. Please look at screenshots provided below to perform the task correctly. Wait until you see Applications folder and look for MacKeeper pop-up or any other suspicious programs on it. Now right click on every of such entries and select Move to Trash. 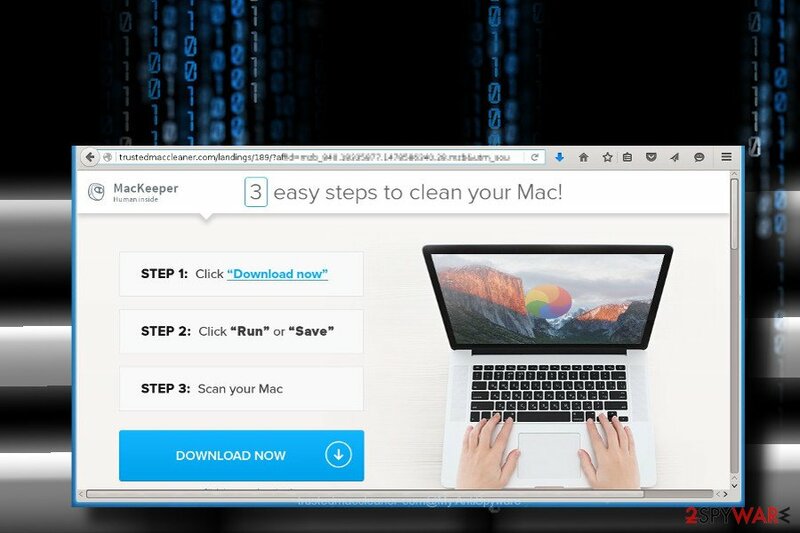 Once these steps are finished, MacKeeper pop-up should be removed from your Microsoft Edge browser. Here, select MacKeeper pop-up and other questionable plugins. Click Remove to delete these entries. Now you will see Reset Firefox to its default state message with Reset Firefox button. Click this button for several times and complete MacKeeper pop-up removal. Here, select MacKeeper pop-up and other malicious plugins and select trash icon to delete these entries. Click Reset to confirm this action and complete MacKeeper pop-up removal. Here, select Extensions and look for MacKeeper pop-up or other suspicious entries. Click on the Uninstall button to get rid each of them. Now you will see a detailed dialog window filled with reset options. All of those options are usually checked, but you can specify which of them you want to reset. Click the Reset button to complete MacKeeper pop-up removal process. ^ Mikey Campbell. MacKeeper to pay out $2M in proposed class action settlement. AppleInsider. Apple news and rumors since 1997. ^ ZeoBIT class action complaint. DocumentCloud. Website that allows users to upload, analyze, annotate, collaborate on and publish primary source documents. ^ MacKeeper official website (controlled by the developer of the software described in the article). MacKeeper. Human inside. ^ Discussion about MacKeeper. Reddit - Mac. Reddit's community of Mac users. ^ Cat Ellis. Avoid and remove potentially unwanted programs (PUPs). Tech Radar India. Technology Tested. This entry was posted on 2019-04-01 at 00:07 and is filed under Adware, Viruses. You can quickly scan the QR code with your mobile device and have MacKeeper pop-up ads manual removal instructions right in your pocket. How did you remove MacKeeper pop-up ads?